Inscribed on verso of mount, in pen and brown ink: Barnard's monogramme / DIX[symbol] / Nathaniel Smith monogramme / Barnard Sale / 1787. Jonathan Richardson, Sr. (1665-1745), London (Lugt 2183) (It was not possible to identify this drawing among those known to have passed to Barnard in the 1747 Richardson sale catalogue); John Barnard (d. 1784), London (Lugt 1419) (The descriptions in the Barnard sale catalogue were too vague to determine conclusively this drawing as part of sale); Nathaniel Smith (Lugt 2297); Rech, Vienna (according to János Scholz); purchased in Zurich in 1953 by János Scholz (1903-1993), New York (see Lugt Suppl. 2933b). Drawings from Lombardy and Adjacent Areas 1480-1620, exh. cat., Mills College Art Gallery, Oakland; Los Angeles County Museum, Los Angeles; H.M. DeYoung Museum, San Francisco; Santa Barbara Museum of Art, Santa Barbara; and Seattle Museum of Art, Seattle, 1956, no. 1 repr. (Abate). Italienische Meisterzeichnungen vom 14. bis zum 18. Jahrhundert aus amerikanischem Besitz: Die Sammlung János Scholz, New York, exh. cat., Kunsthalle, Hamburg, and Wallraf-Richartz-Museum, Cologne, 1963-64, no. 1. 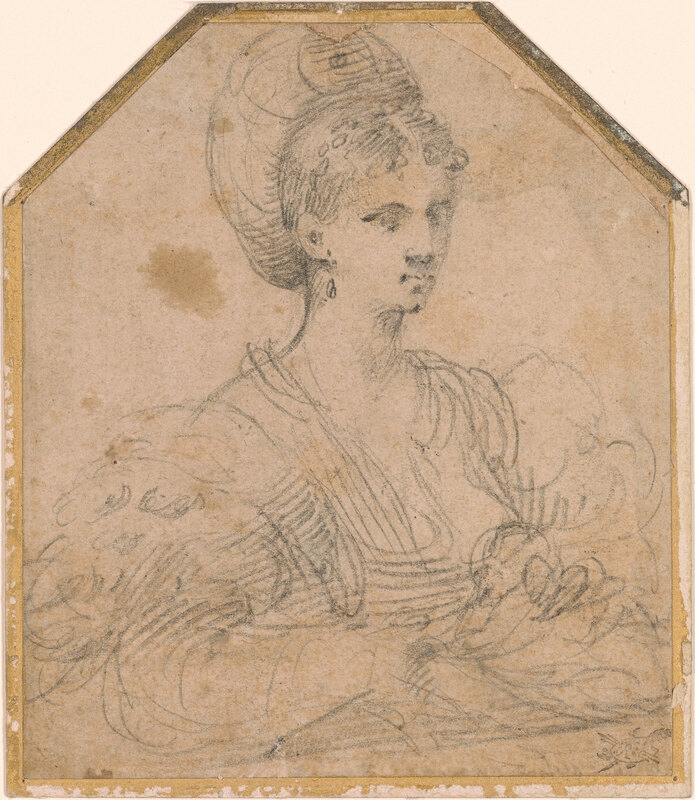 Italian Drawings from the Collection of János Scholz, exh. cat. with preface by Andrew C. Ritchie and Egbert Haverkamp-Begemann, Yale University Art Gallery, New Haven, 1964, (n.p. ), no. 19. Sylvie M. Béguin, Mostra di Nicolò dell'Abate. Catalogo critico, exh. cat., Palazzo dell'Archiginnasio, Bologna, 1969, no. 46, repr. Konrad Oberhuber and Dean Walker, Sixteenth Century Italian Drawings From the Collection of János Scholz, exh. cat., National Gallery of Art, Washington, D.C., and The Pierpont Morgan Library, New York, 1973-1974, pp. 57-59, no. 47, repr. Cristiana Garofalo in: Storie dipinte: Nicolò dell'Abate e la pittura del Cinquecento tra Modena e Parigi, exh. cat., Museo Civico d'Arte, Modena, 2005, p. 354, no. 137, repr. in color. The study remains to date the only portrait drawing by the artist; it depicts a young woman in three-quarter view in elegant dress, caressing a small monkey, a not uncommon pet at the time, with her left hand. It most likely dates from the artist's Bolognese period (1547-1552), as witnessed by the strong influence of Parmigianino's work. Painted portraits by dell'Abate are also rare. They include the Half-length Portrait of a Woman in the Galleria Borghese, Rome, which may well be related to the present drawing, with which it corresponds in the sitter's pose, "balzo"-headdress, puffed sleeves and other details such as the presence of a pendant pearl earring (1). The Borghese painting does not include a monkey, though the canvas may well have been trimmed along the lower and right edges. A portrait of a young woman by Nicolò dell'Abate in the Prado, Madrid, is also comparable, though here the sitter is more frontally posed and rests her right hand on a glove lying on a ledge (inv. 5).